I was lucky enough to get a PieBox for Christmas (thanks, Ma! 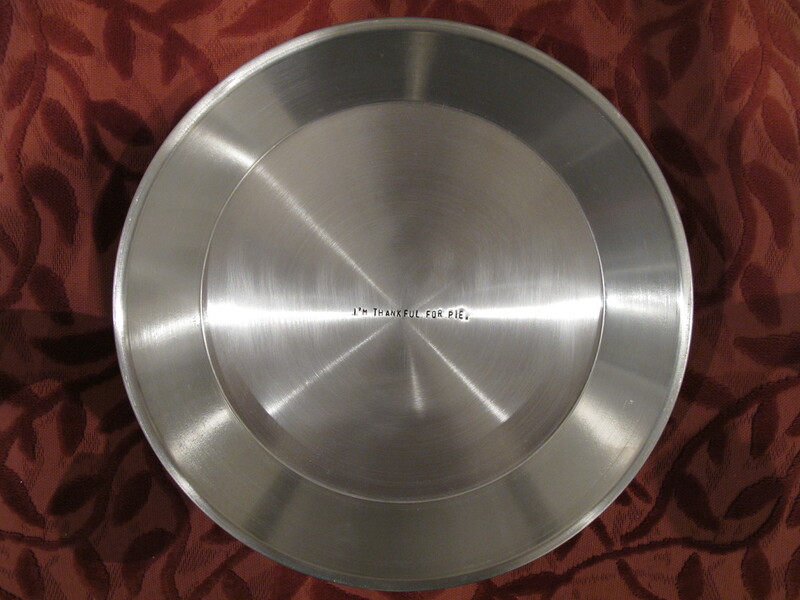 ), so when my friend had people over for dinner, I wanted to give my PieBox a try. I’ve never actually made pie, so I was looking for a simple recipe. I found this great one from Posie Harwood on Food52 — it’s a chocolate pie, with a slight hint of coconut, a graham cracker crust, and can be covered in raspberries and whipped cream. The crust is so easy — it’d be great for a pumpkin, cream, or lemon meringue pie, too. And, aside from cooking the crust a bit, the recipe is pretty much no-bake. 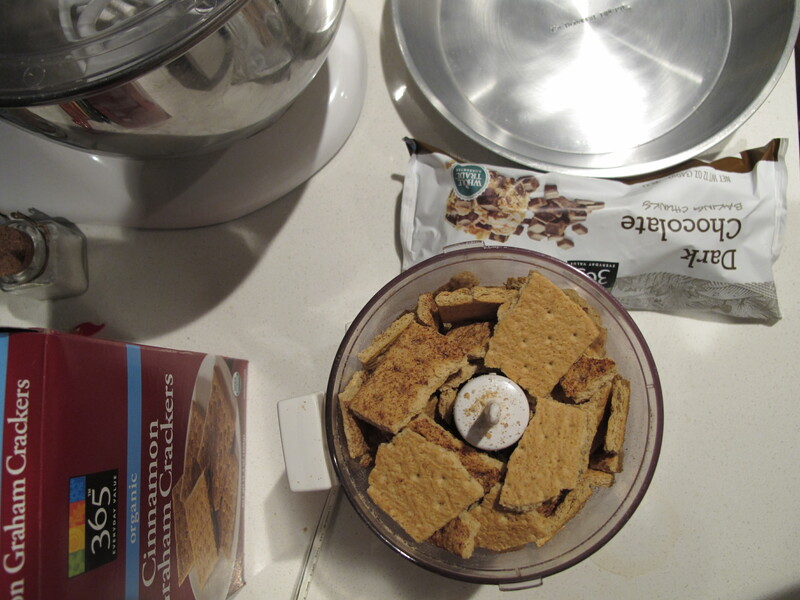 Crumble the graham crackers in a food processor (or a blender, or with your hands) until they are fine crumbs. 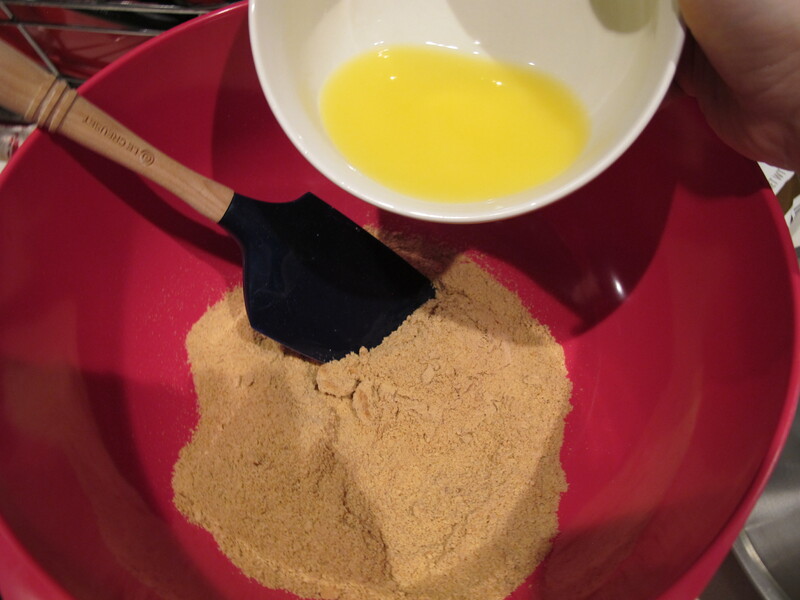 Melt the butter and mix it in with the graham crackers with a wooden spoon. 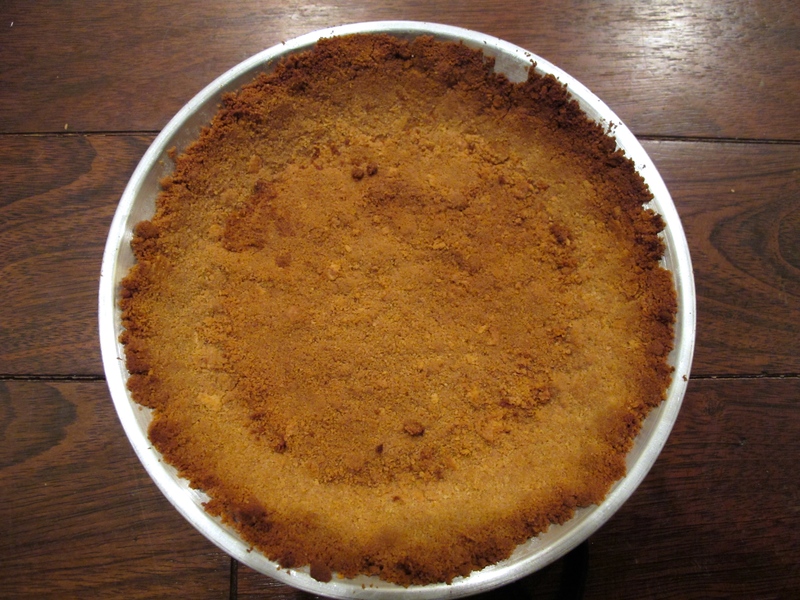 Press the graham cracker mixture into the pie plate, spreading it out evenly. Bake the crust for 8 to 10 minutes, or until it’s a nice golden brown. Let the crust cool for at least 30 minutes. Melt the chocolate over a double boiler (or, if you’re lazy like me, you can just slowly melt the chocolate and mix it constantly with a wooden spoon so it can melt without burning). Whisk the chocolate and the coconut milk together in a medium-sized bowl. Pour the chocolate mixture into the cooled pie crust. If you have time, you can let the pie cool on the counter or in the fridge, but I’d recommend putting it in the freezer for a bit — it’s great when it’s colder (and would be even better with a little vanilla ice cream, as are most things). I put it directly in the freezer, and it was pretty much solid after an hour or so. Place all the raspberries on top of the pie, and add whipped cream if you’d like. Enjoy! 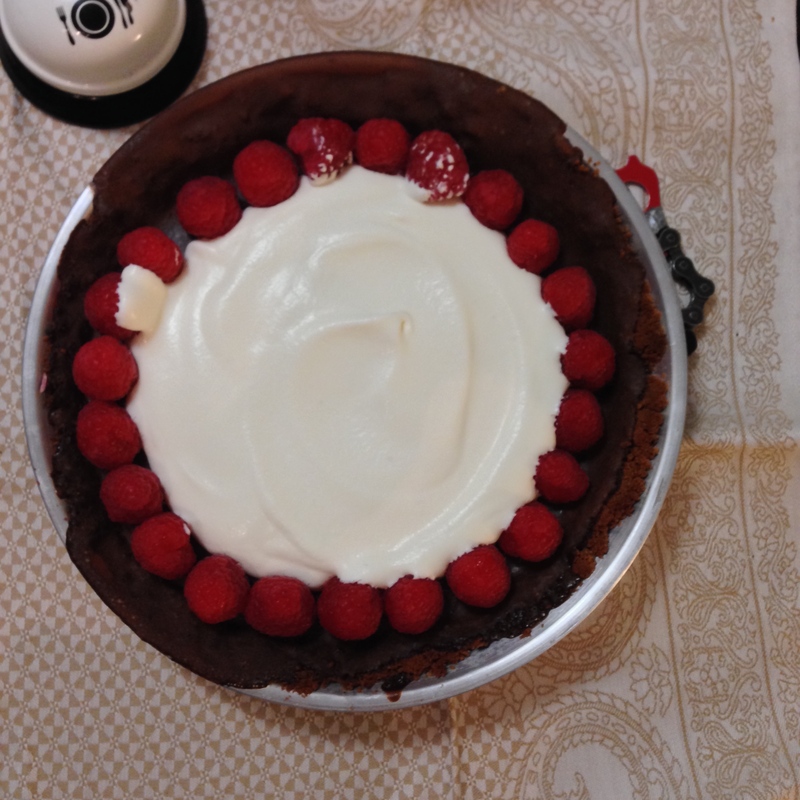 This entry was posted in Noms and tagged Chocolate, chocolate pie, coconut milk, dessert, easy dessert, easy pie, graham cracker pie, no bake, pie crust, raspberries. Bookmark the permalink.